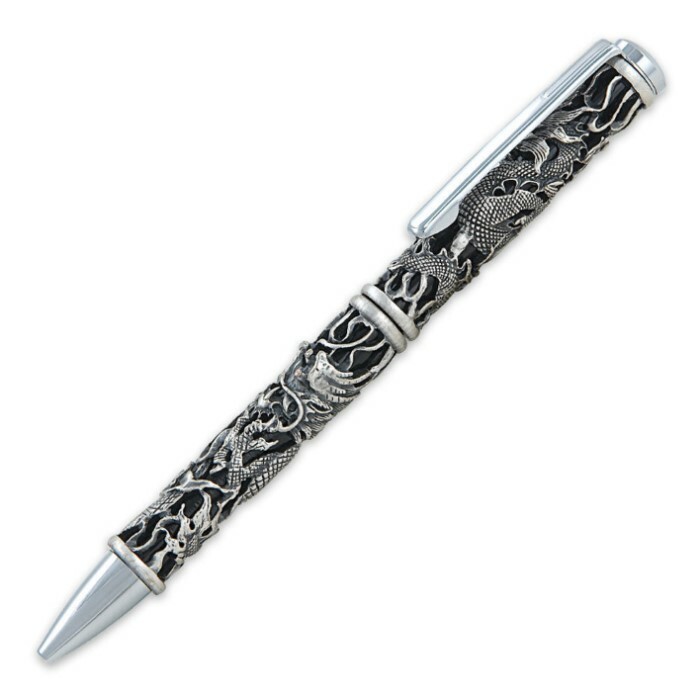 Add a touch of flair to your daily paperwork drill with this beautiful pewter pen in your hand. The design of a Chinese dragon entwined around the barrel of the pen is sure to catch everyone"s eye. The pen is retractable and refillable. Measures 5 1/4" overall. very detailed, writes great, a must have. I BOUGHT ONE A COUPLE MONTHS AGO. THE PEN IS A WORK OF ART, WRITES REALLY NICE HAND ITS PRETTY HEAVY AS PENS GO. ONLY PROBLEM IS NO! REFILLS ARE LISTED IN THE CATALOG OR THE INTERNET, I WANTED TO BUY SEVERAL BUT NO REFILLS TO BUY ARE PROVIDED ITS A SHAME TO HAVE SUCH A WORK OF ART NOT KNOWING WHEN IT WILL STOP RUN OUT INK. HOPE BUDK CAN GET SOME BEFORE X-MAS. I WANTED TO GIVE 3 STARS, BUT HIT THE 1 BY MISTAKE.